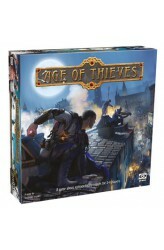 Age of Thieves is a fantasy board game of strategy and adventure set in Hadria, a port metropolis located on the northern fringes of a mighty Empire. Each player becomes a master thief about to commit the most daring burglary of his career. During the game players may use unique abilities of their thieves as well as various action cards, which represent maneuvers, alchemical potions or complicated devices inspired by visionary ideas of Renaissance inventors. The players choose cards to play and then use available Action Points to plan the order of their activities. This makes the game very dynamic, with each resolved action dramatically influencing the turn. The players’ order changes dynamically depending on the number of Action Points placed on each chosen card. The goal of t..